Today was a good day once my migraine went away. I went this morning for a hike with my friend, her dogs, and my dogs. We went along a trail that follows this good size stream that ends in a waterfall. The dogs had a great time and it helped Chase get a little more confident in the water as my friends dog’s love to swim. Baxter in his usual style would only put his paws in and drink and had no other interest. Chase eventually worked up to getting almost fully covered, but never got up the nerve to swim. Maybe after a few more times with his swimming buddies he will try it out. The water is pretty calm so it will be a good place for him to try it out. I forgot to take my camera… I will try to remember next time. The chickens got a good treat after dinner tonight…. 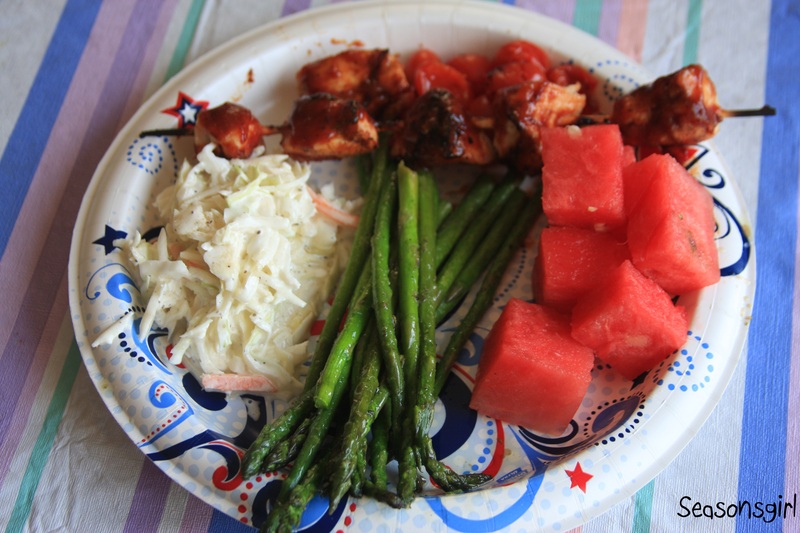 For dinner we had BBQ Chicken on a stick, grilled tomatoes, grilled asparagus, coleslaw, and watermelon. The chickens enjoyed the rinds, fighting over them, it was funny. The pups got some of the chicken scraps I cooked up, they always like this treat. I spent most of the day after our walk in the kitchen or on the front porch. It didn’t get as hot as it was supposed to thankfully so I was able to enjoy the outside on the porch swing reading magazines I am behind on. Overall (after the Migraine) it was a nice day… What did you do today ? Ah, we must remember that Chickens like watermelon skins – will save them as a treat next time. Thanks for passing that on. OMG I just gave some watermelon to my ladies this morning and they loved it.Not so many of my goats like it but our newest little baby Fiona loves it! That plate is about the most delicious thing I’ve seen. I am craving watermelon and asparagus now! 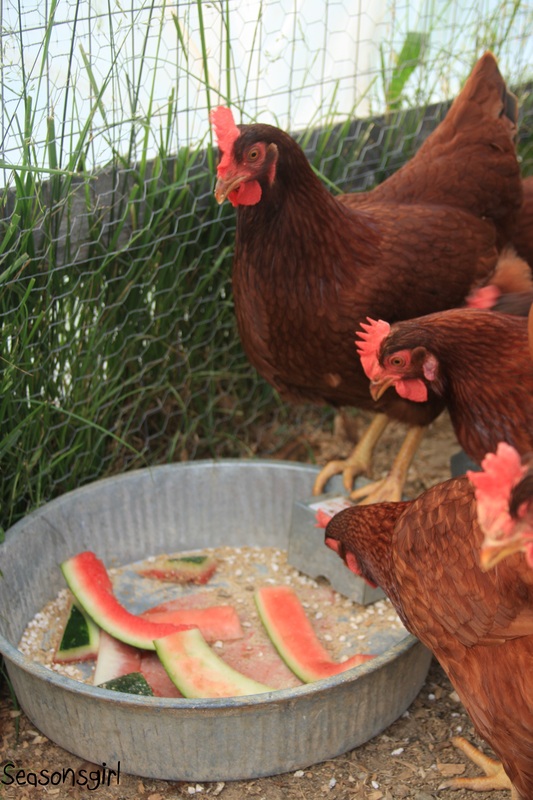 Strangely enough, our chickens aren’t big fans of the watermelon rind. But you toss in some of the red stuff and watch out! Absolutely hysterical! A chicken grudge match!